I was delighted to be invited along and to take photos at the North West Simon Community Nollaig na mban – Little Black Dress Luncheon yesterday. The dress code was a little black dress with a splash of yellow. Now I don’t usually do dresses as I’m usually in jeans and walking boots so it was a lovely change to have the chance to get all dressed up. 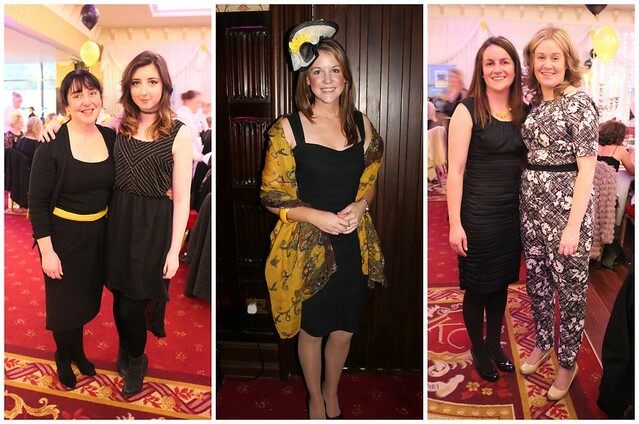 The event was held in the beautiful Kilronan Castle. It was the perfect setting and well over 200 ladies came along for an afternoon of wonderful food, company, competitions and laughter. We also got to hear some interesting speakers and check out some lovely goodies from various companies. Fashion blogger ‘The Sequin Cinderella’ was there to judge the best dressed lady and gave a very interesting talk about her blog and what inspires her. She also took a photo of Lucy and I (above left). I have to admit I struggled with the splash of yellow part. I was going to wear a reflective jacket and a road cone with a matching ‘wet floor sign’ but Lucy threatened to disown me if I did. I also wondered if my yellow teeth would count as an accessory…perhaps not and at one stage was even going to wear a bunch on bananas as a hat. Fiona came to my rescue though and let me borrow a fabulous yellow bag and scarf which I wore as a belt (the scarf not the bag). Sheila Gilroy-Collins deservedly won the best dressed lady with a fabulous dress made of images of homelessness. She is pictured above with Mary McKeown from the North West Simon Community. After a mulled wine reception in ‘The Dungeon’, we made our way to the beautiful ballroom which was adorned in black and yellow balloons, red velvet chairs and candelabras. Dinner was vegetable soup followed by roast beef or salmon and rounded off with a lovely apple crumble and ice cream. There was also red or white wine but as I was driving I stuck to water. I have to give a special mention to the waiting staff, they were so efficient and almost synchronised in their service – if waiting tables was an Olympic sport they’d have won gold. Beauty from Within was there carrying out manicures…I wish I’d have known beforehand I wouldn’t have badly painted my nails! Joanne Sweeney-Burke was the MC for the afternoon. I was just blown away listening to her story, you’d wonder how one person could cope with all that life has thrown at them and she really was inspirational to listen to. Her message is one of hope and to never give up trying. There was another inspirational lady who told us her story. Her name was Riona, she was homeless, she contacted North West Simon who helped her find accommodation. She is now at college and has her life back on track, she is so grateful to Simon she now volunteers with them. Fiona Egan, the Chairperson of the North West Simon Community, told us about the organisation and that people need to realise homelessness doesn’t just mean you are out on the street, it also means people who ‘couch surf’ at friends houses as they don’t have a home of their own. The Simon Community are always looking for volunteers so if you can help please do get in touch. Well done to Mary and Michelle for organising such a wonderful day and thank you for inviting me to be part of it. You can read Lucy’s much better blog of the day here. What a wonderful event in such an elegant setting for such a fantastic cause, and so well documented, Magnum Lady! You and Lucy looked absolutely lovely although I’m disappointed not to see the banana headdress 😉 Well done to all of those who work with the Simon Community — what you do is so important, especially during these still rough economic times.